I'm learning my new-to-me Taipan 4.9, and was wondering what kind of boat speed I should be targeting upwind in 10-15 knots true, relatively flat water. I just don't know if I'm even in the ballpark yet, so any advice will help. Also, racing on a set course, I've been coming up in the puffs, but that seems slow. Is that correct? Should I be easing instead? No such thing as polars I'm afraid - at least none I've found. Only comment I can offer is in the 2nd question. Its faster to ease in the puffs. However you have to consider you and your crew's ability to do that for a full day of sailing. Truth is some combination of easing/feathering which is very dependent on a whole host of variables. However, as a general rule, assuming you're overpowered, the more you ease the faster. However, don't ease so much that you're footing too much. Also, don't forget the cunningham. It's an incredibly effective de-powering tool. I've been told the goal is to adjust the cunningham such that your sheet adjustments are only inches (not feet) at a time. If there are lots of variations in wind strength, it might require 3-4 cunningham adjustments on an upwind leg. Last edited by rehmbo; 03/25/16 06:13 AM. Definately agree on the importance of the cunningham. If my Falcon is trimmed correctly than I don't need to ease more than one arm length in the puffs. One up depowering the boat is even more important upwind to keep drive and not to head up each time, slowing you down. In 2 up we play the cunningham each time we see a puff to keep forward drive. It is huge which difference it makes compared to teams only using the main. Speed is difficult as it will differ a lot when you foot a bit. Lining up is the best thing to do. Just thinking out loud, wouldn't heading up in a puff be 'faster' in the upwind leg, as in each puff you are gaining some height? Nope, its all about VMG. Most monohulls don't plane upwind, so this can be true for them, but those that do (505's, 49er's, I14's, big canting keel monsters) often have two modes, a point high mode and a faster VMG, couple degree lower mode but in full tilt plane. 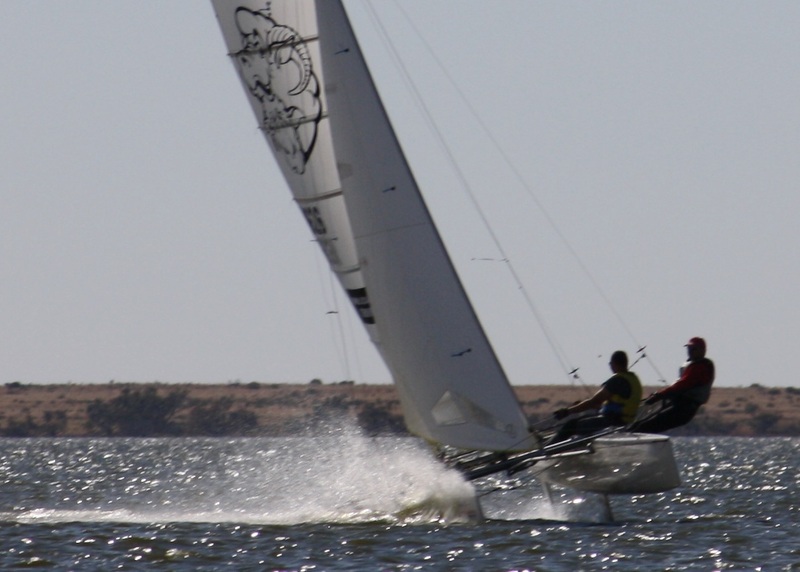 Often, and this is especially true for high performance beachcats equipped with the latest high-tech foils, it is faster to ease, come down a few degrees, accelerate, then you can climb on the foils back up to the previous height but with more speed. Key is not to come down too much and go reaching around the course instead of upwind. In big breeze if you run out of downhaul and diamond wire and are still easing main, dropping the traveler a few inches may help, allowing you to keep leech tension on with less pressure in the main.